It's a phrase commonly bandied about in boxing and MMA circles. Its primary meaning relates to the excitement of the fight: Match up two wrestlers with limited striking and submission skills in an MMA fight and you'll produce a drab affair; face a Muay Thai kickboxer against a Brazilian jiu-jitsu black belt, though, and you've opened up countless strategic and stylistic possibilities. The second meaning, though, has to do with dethroning great fighters. Most champions are great, but all are fallible. Everyone's got a flaw or a relative weakness, and given the right opponent with the right style, properly exploiting that flaw can lead to victory for an otherwise inferior fighter. This weekend's AFC playoff matchups are defined by the unique styles and skills of each team. The Jets bring the league's best pass defense to San Diego, where they take on the league's best pass offense. A brilliant pass rush goes up against a quarterback who thrives on throwing the deep ball. Opposed, their skills present a tantalizing battle of strength vs. strength. In the other half of the bracket, two Hall of Famers try to read each other's minds. No two units in the league create more fear and confusion before the snap than Peyton Manning's offense and Ray Lewis's defense. By disguising their intentions presnap and looking for knockout blows afterwards, the combination of these two teams results in more opportunities for huge, game-changing plays on either side of the ball than perhaps any other two squadrons in football. The lone challenger might be the Jets-Chargers matchup a day later. And the presence of just one player on the Ravens' defense could make all the difference in the world. Matchups make games. This weekend's tilts aren't striker versus grappler; they're striker versus striker. No other four teams in the AFC could produce matchups this compelling; no other combination of these four teams would yield matchups quite as interesting. We can suggest how each team will try and attack, and make inferences about potential strengths and weaknesses, but you won't see much in the way of predictions in this piece beyond this: Thanks to the unique matchups these two games possess, the AFC could very well produce two classic games this weekend. In the charts we've included on this page, games where teams sat their starters are colored differently and are not included in the trendlines. In addition, we've calculated weighted DVOA without those "sit starters" games for those respective teams, and have included those numbers in this article. The Colts and the Ravens are like oil and water. One is led by a quarterback who already has a gold sportcoat in his closet, and the other has a quarterback that completed four passes in a victory last week. One is famed for a blitz-heavy 3-4 defense led by an elite linebacker, and the other won a title with their 4-3 scheme that rarely blitzes and views most linebackers as replaceable talent. One has an elite safety that rarely comes off the field, the other has an elite safety that rarely gets on it. There's even collegiate battles reborn: Tennessee vs. Miami! Maryland vs. Miami! Miami vs. Miami! Rutgers vs ... Mount Union? Well, they all can't be glamour matchups. Those clashing identities came out in Week 11, a frustrating football game played to a near-draw. The Ravens bookended their turns to touch the football with fumbles, starting with a Lardarius Webb kickoff return that was fumbled a fraction of a second after Webb hit the ground, and ending with the Ed Reed Special: An ill-advised lateral on a punt return with 20 seconds left, resulting in a fumble that was recovered by the Colts to seal a 17-15 victory. Inbetween, they kicked five field goals, missed a sixth, and were stuffed on three consecutive plays inside the two-yard line. The Colts made their own mistakes. Peyton Manning threw two interceptions on two very questionable decisions, and while seldom-used tight end Tom Santi had a breakout game with six catches and several great blocks on the edge, his fumble inside the five cost the Colts a touchdown. False starts went uncalled. ACLs were torn. Ribs were broken. It was the sort of old-school game that the participants would smile about but wouldn't hold up on second viewing, and worst of all, Greg Gumbel and Dan Dierdorf were calling it. This Saturday's rematch should be very similar, although some of the faces for Baltimore will be different. The venue shifts from Baltimore to Indy, and while the Ravens won't be making the trek on Mayflower trucks, the Colts should be better on their home turf than they are on the road. (That's "should" and not "will" because Indianapolis's offensive DVOA is 13th at home and leads the league on the road, and their defense is 15th in either spot.) Expect big plays and compelling back-and-forth football, but if you're looking to pick a winner, expect it to come down to the play of two Ravens players. Before reading this section, check out the excellent Cover-3 penned by Doug Farrar this week, with details on why the Ravens struggled in short yardage and only ended up with 15 points. There's no subtle player that makes the Ravens go; their offense is built around Ray Rice, who repeated last year's Matt Forte trick of leading his team in both carries and receptions. Furthermore, Rice was targeted on a league-high 101 passes, 21 more than any other running back. Stopping Rice has to be the Colts' biggest concern on defense, even before getting pressure on Joe Flacco. Although the Patriots didn't do many things right last week, one thing they did do well was shut down Rice as a receiver. Rice was held without a catch for the first time this season, although it admittedly came on only ten pass attempts from Flacco. That was thanks to bracket coverage on Rice coming out of the backfield, with a linebacker assigned to shadow him on every play and a defensive back preventing him from getting outside. The Colts will have to account for Rice in a similar manner. Rice had seven catches for 64 yards against them in Week 11, including three first downs. Rice was often used in a swing role as a blocker/dumpoff receiver, releasing into the hashmarks after no rusher had occupied him. Although he's not the primary receiver on most plays, he's often Flacco's second look and open frequently enough to justify his target patterns. Flacco can rely on Rice too much, though, which led to a game-changing interception in the fourth quarter of the first game. With the Ravens down two and 2:49 left in the game, they faced a third-and-7 from the Colts 14-yard line. They lined up in a three-wide receiver set, with Kelley Washington in the slot and Todd Heap at tight end. The Colts crowded the A-gaps with linebackers Gary Brackett and Clint Session, threatening a double A-gap blitz. At the snap, all six rushers came forward, with the Ravens sending all four receivers out into routes. Instead of staying in to block, Rice immediately went to the hashmarks to serve as the hot route. 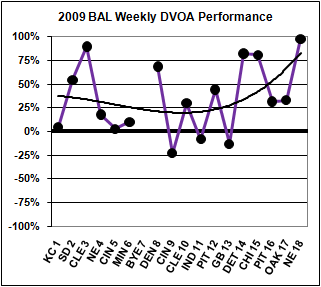 On Flacco's second step backwards, the blitz disappeared off radar. Three of the six rushers -- the two linebackers and defensive end Robert Mathis -- stopped rushing and started dropping back into the center of the field, waiting for Rice. Flacco finished his drop, surveyed the field, and then threw his checkdown to Rice, who was triple-covered by the three disappearing blitzers. Brackett picked the pass off, and the Ravens' chance to take the lead evaporated. Considering the situation and the coverage, it was probably the worst pass Joe Flacco's thrown as a professional. Indianapolis's blitz schemes remain firmly in the transitional phase, though. After firmly adhering to Tony Dungy's Tampa-2 scheme and building their defense around capably getting to the quarterback with their front four, new head coach Jim Caldwell turned up the dial on more blitzes this year. Outside of the Ravens game, Indy rushed five or more defenders on 25 percent of charted pass plays, a step up from their 16 percent rate of a year ago. Against the Ravens, though, their blitz disappeared; they sent five or more rushers on only five of Flacco's 34 dropbacks, sending exactly four rushers 27 times. Their five blitzes yielded three first downs, including a 45-yard bomb to Derrick Mason thrown out of the Ravens' end zone that ended in a simultaneous possession by Mason and Jerraud Powers. Only two of the five Colts' blitzes yielded hurries, and they all came on either second- or third-and-long; they've gotten pressure on their blitzes against teams besides the Ravens 32 percent of the time (against a league average of 28 percent), and only 21 percent of their blitzes have come on first down. One difference between the Ravens' offense that shows up on Sunday and the one that was up against the Colts in November may be Flacco's hip. Many of Flacco's throws against the Colts were to the sidelines; virtually all of his passes that weren't dumpoffs to Rice were out patterns of various distances. Flacco clearly had troubles with his hip against the Patriots on Sunday, and if Flacco has mechanical issues and can't get any zip on his ball, Baltimore will have serious issues in the passing game. Gaither and fellow tackle Michael Oher had excellent days against Mathis and Dwight Freeney, holding the pair without a sack. They did combine for five hurries, though, so expect the Colts' star ends to get to Flacco just by the law of averages at one point or another. Freeney had his best success getting underneath the the mammoth Gaither at the line of scrimmage and driving him backwards into Flacco; it's hard for him to resist the urge to run around tackles, but the Colts would be better off for it. It's horrible to think that a human being might be defined by his or her failures. And yet, Custer's the guy who got taken out at Little Big Horn, Pete Best wasn't good enough to drum for the Beatles, and Roc Alexander will forever be remembered as Peyton Manning's plaything from one disastrous game in the 2004 AFC playoffs. Alexander might soon have company. Enter one Frank Walker. An argument against both the validity of game charting numbers and Ozzie Newsome's personnel skills, Walker is one of the worst cornerbacks in football. When he does make his way onto the field, teams go out of their way to target him, even though the average Domonique Foxworth resides on the other side. When he's not losing receivers in coverage, Walker's also a magnet for penalties. He's DeAngelo Hall without the speed or the ball skills, Shawn Springs without the great instincts, or Nnamdi Asomugha without the anything. And he's starting at corner for the Ravens this weekend. Walker's not supposed to be a starting cornerback, but will be forced into action thanks to injuries. Struggling starter Fabian Washington tore his ACL in the fourth quarter of the Week 11 matchup between these two teams, and rookie Lardarius Webb tore an ACL of his own in Week 15 against Chicago. Undersized Chris Carr is next on the depth chart, but he's an effective slot corner that's too small to play on the outside. Retread Corey Ivy matches Carr's skill set, and rookie Cary Williams is strictly a special teams player and corner of last resort. That places Walker on the outside, likely against Pierre Garcon or Austin Collie on most plays. Manning might also exploit Walker indirectly; if the Ravens have to give Walker additional safety help on most plays, their blitz packages will be limited, and opportunities will open up on the other side of the field for Reggie Wayne against Foxworth in one-on-one coverage. In the first game, the Ravens did a good job of taking away Dallas Clark with the same sort of bracket coverage that they placed on Wes Welker in their matchup with the Patriots, but they left opportunities downfield for Manning to exploit. The Colts' biggest play of the day came in the first quarter, when Manning took advantage of the Ravens' aggressiveness to pick up 66 yards on one pass to Reggie Wayne. The Colts lined up with twin wide receivers on one side, while the Ravens showed man coverage against both of them. On the snap, Lardarius Webb, who was in man coverage in the slot, blitzed. With Webb onrushing, Manning froze three players with one pump fake, including Webb, who lept in the ear to try and knock the pass down. Foxworth -- who was actually in zone coverage on the side of the field with the twin receivers and was standing next to Wayne at the time of the pump fake -- didn't pursue Wayne's go route, and while Ed Reed was supposed to be providing safety support over the top, the pump fake got Reed rushing towards the slot receiver. That left Reggie Wayne, elite receiver, wide open streaking downfield. On the other hand, Manning also got himself in trouble throwing downfield, with two interceptions that weren't impressive. On the first, Manning tried to fit a ball to Clark into a tight window against a Cover-2, and Washington was able to get back quickly enough to break up the pass and bat it into the air, leaving an easy pick for Dawan Landry. The second throw was virtually the exact same play as Manning's long completion to Wayne, with a pump fake attempting to get Reed and Foxworth off of Wayne and failing. Foxworth stuck with Wayne deep, and Reed undercut the pass to pick it off. That pass went 34 yards in the air; the long completion went 33. Faced with elite opposition, both these teams flinch stylistically. The Colts spent most of their time during the regular season encounter between these two teams in a two-tight end set, with two wide receivers split to one side of the field or the other. The goal there is to combine formations with motion before the snap to make reading the Ravens' coverage before the snap an easier process. In response, a Ravens defender will occasionally sprint towards the line of scrimmage and feign like they've been caught in a forthcoming blitz by Manning before the snap, only to not rush once the ball's been snapped. It's a fascinating game of cat-and-mouse, even before the ball's out of Jeff Saturday's hand. Baltimore will spend most of their time against this base offense in a 4-2-5 set, with Carr as the nickelback in the slot when the Colts go with twin wide receivers on one side. The Ravens did not have Terrell Suggs in Week 11, so Jarret Johnson lined up with his hand in the dirt on the line; expect Suggs to play that role this week, and give hobbled left tackle Charlie Johnson more trouble than Jarret Johnson did. When the Colts split out Clark, the Ravens move back into a 3-3-5 and line up Carr directly over Clark, giving him help from the extra linebacker. One player who had an unexpectedly big game when these two teams met was tight end Tom Santi, who played a key role throughout the day. His six catches for 80 yards came despite his failing to catch a pass in 2009 before the game while only catching two passes for 27 yards afterwards. It was a role dictated by matchups; Santi was being left uncovered and finding holes in the Ravens' zones, with Baltimore too busy focusing on Wayne, Clark, Garcon, and Collie. That all came crashing down, though, when Santi caught a quick out at the five-yard line, turned upfield and ran for the endzone…and got waylaid by Reed and then Lewis, fumbling the ball away in the process. Back to the L.E.S for you, young man. Santi was also a key contributor in the running game, which had a good day against the Ravens. The Colts' success rate against the Ravens was right above 42 percent (league average against Baltimore: 36 percent), and Santi was mostly effective sealing the edge against Johnson and even Trevor Pryce, allowing the Colts to pull an offensive lineman to the outside or get them to block the Ravens' linebackers at the second level. Also worth noting is that, besides Suggs' absence, Haloti Ngata was returning from an ankle injury and not at 100 percent, while Ray Lewis hurt his ankle during the game and was hobbled for most of the first half. Ngata played well, but took a stupid late hit penalty that turned a second-and-long into a first down for the Colts. One interesting statistical note: Although it seems entirely counterintuitive, the Colts are actually the better short-yardage team of these two this year. Indianapolis was 12th running the ball in power situations and sixth against them, while Baltimore was ninth offensively and 11th when defending them. The Colts shut down the Ravens on three carries inside the two, holding them to a field goal in the process. They might not be able to pull that off again, but what happened wasn't exactly a fluke, either. Billy Cundiff kicked five field goals in the first game between these two teams, but missed a sixth that would've been the eventual margin of victory. Cundiff remains very good on kickoffs, and Carr is a solid return man, but Reed gave the ball away on the Ravens' final punt return with one of his patented laterals. Indy is right around average everywhere short punting, where they're slightly above-average, and on punt returns, where they're slightly below-average. Matt Stover will be kicking for them, with Adam Vinatieri likely inactive thanks to a bad knee. A lot of this game will depend upon whether either team gets an early lead of more than a touchdown. If the Colts go up by two touchdowns early, they can rest assured that the Ravens will need to throw the ball, and pin Freeney and Mathis's ears back while dropping seven people into coverage, forcing Flacco to beat them. If the Ravens repeat their first quarter magic of a week ago, they can take the air out of the ball in much the same way they did against the Patriots, keeping Manning on the sidelines for an eight- or nine-possession game while forcing the Colts' defense to come up with stops against the run. We know this much: If Ed Reed can cover for Frank Walker against Peyton Manning and Reggie Wayne, they should re-open the Defensive Player of the Year voting. The first AFC playoff game this year without a previous encounter during the regular season, the Jets' team that travels to San Diego this weekend bears little resemblance to the one that was shellacked 49-28 against the Chargers in Week 3 of the 2008 season. The closest thing the Chargers have seen to this year's Jets are the Ravens, who came into Qualcomm Stadium in Week 2 and emerged 31-26 winners, even after allowing Philip Rivers to throw for 421 yards. Then again, that Chargers team doesn't have much in common with the one that will be suiting up on Sunday afternoon. They were without two starters on the offensive line as well as halfback LaDainian Tomlinson, and have radically changed the makeup of their defensive line and secondary since that game. Cornerback Antoine Cason, the biggest hole in the team's secondary, has been demoted from struggling nickelback to rarely seen dime back, which means he'll be virtually irrelevant against the Jets. The team will rotate as many as nine players that were either not on the roster or well out of the rotation at the beginning of the year into the lineup for significant action on Sunday. Mark Sanchez's great game against the Bengals, though, seems to have elevated his reputation back to where it was after the Jets' 3-0 start; the "Sanchize" adjective has gone full-circle, from cool to ironic and back. That cycle takes 40 years in pop culture, so twelve weeks or so is pretty impressive. Can he hold onto it for another week? As we mentioned in last week's preview, the Jets weren't able to recreate their third-down magic from Week 17 when running the ball against the Bengals in the Wild Card round. In fact, the Jets' five carries on third down didn't yield a single first down. That's one of the reasons why, despite Shonn Greene's 135 rushing yards, that the Jets rushing attack produced a -3.2% DVOA and 37 percent success rate on their 38 carries. 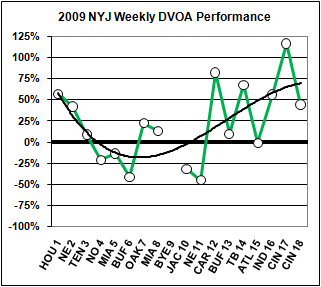 That's below their season-ending rushing DVOA of 3.6%, and well off the pace of their 46 percent success rate. In all fairness to Greene, he produced a 33.3% DVOA on his 21 carries; Thomas Jones had 15 carries for 34 yards and a -47.1% DVOA, while Brad Smith's two carries for four yards produced a dismal -84.8% DVOA. Of course, in football, nothing is static; the Jets will likely run the same play-action this week and have Keller break off his route, or expect a safety to push down on Keller and let Sanchez take a shot downfield with Braylon Edwards in one-on-one coverage. Then again, Edwards has to catch that pass; he dropped another touchdown pass last week against the Bengals. The question of who will be covering Edwards remains up in the air. To stay away from Leon Hall and Johnathan Joseph on every snap, the Jets often lined up Edwards and Jerricho Cotchery on the same side of the field in twin wide receiver sets. While the Bengals often opted to keep Hall and Joseph marooned on their islands, the Chargers aren't likely to play the same way; they're comfortable moving cornerbacks Quentin Jammer or Antonio Cromartie into the slot next to the other, allowing them to play man coverage with their two best corners on the Jets' two best receivers. If the Jets go three-wide, the Chargers will bring in former safety Steve Gregory at nickelback; Gregory's a talented young player with good skills around the ball and as a rusher off the edge, but there's a reason he was converted from cornerback to safety when he left Syracuse; he lacks the speed and size to be a regular cornerback. It behooves the Jets to try and get Edwards matched up against Gregory in the slot; the result could be a big play downfield. Gregory's move into the nickel corner role is just one of the many changes the Chargers' defense has undergone. In the secondary alone, rookie Kevin Ellison has taken over for the ineffective Clinton Hart, who was waived in October. 2008 supplemental draft pick Paul Oliver has moved into the nickel safety role, while the disappointing Cason looked good in the meaningless Week 17 win over the Redskins, but has otherwise lost his job and won't see much of the field on Sunday. Even more staggering is what's happened up front. The Chargers are on their third nose tackle, with All-Pro Jamal Williams lost for the year in Week 1 with a triceps injury, and backup Ogemdi Nwagbuo going on IR in Week 13. The starter now is the well-traveled Ian Scott, who the Chargers cut in camp and then re-signed after Williams' injury. Scott took over as the starter in Week 9, and spent most of the second half as the team's starting nose tackle. He's helped the rush defense go from bad (27th in rush defense DVOA in Weeks 1-9) to passable (17th in the same stat from Weeks 10-17). Starting ends Luis Castillo and Jacques Cesaire have also missed time with various maladies, opening up opportunities for rookie Vaughn Martin and castoffs like Antonio Garay and Alfonso Boone, all of whom have made an impact in limited time. The Chargers will rotate their defensive ends more than they did during the Olshansky-Williams-Castillo era, giving the Jets different looks depending upon the game situation and the oxygen levels of everyone involved. The three defensive linemen rushing on pass plays shouldn't cause Sanchez too much trouble, but while the Chargers will almost always send at least one linebacker or defensive back to go along with their down linemen, it's when the team sends two that Sanchez could struggle. The Jets' offense is currently the worst in the league when opposing defenses rush five; meanwhile, the Chargers rush five players better than 36 percent of the time, well above the league average of just under 24 percent. Rushing five can limit Sanchez's checkdowns, with more backs and tight ends required to block, and force him into mistakes downfield. When the Jets do run the ball, expect plenty of carries at right tackle, where the Jets can use right guard Brandon Moore to fend off linebackers at the second level and pull Pro Bowl left guard Alan Faneca through the exposed gap. The Jets had the league's best Adjusted Line Yards running at right tackle, and ran there a disproportionate 23 percent of the time, more frequently than anyone besides St. Louis. That's not a problem for San Diego, as the Chargers rank in the mid-twenties in defensive Adjusted Line Yards at every spot but one: Right tackle (or left end from the defense's perspective), where they're fifth in the league. Chad Ochocinco and Carson Palmer were the latest to exemplify that you don't come away from Revis Island with anything to write home about. So how do you solve the Revis problem and move the ball effectively on the Jets' defense? You start by island-hopping. Unlike the Bengals, the Chargers have two receiving threats that raise equal concern, if not necessarily in the same way: Wide receiver Vincent Jackson and tight end Antonio Gates. Unlike virtually any team in football, the Chargers are extremely comfortable placing Jackson and especially Gates in any of the receiver spots. Beyond the fact that they don't often line up on the same side, virtually any combination is possible. Jackson in the slot next to a split-out Malcom Floyd, with Gates alone as the split end on the other side of the line. Gates in the slot next to Floyd with Jackson alone on the other side of the field. Gates in a two-tight end set, hand in the dirt, and Jackson slotted right behind him in what charters know as the "All Tight" formation. Gates lined up alongside Rivers and Darren Sproles as split backs in the shotgun, with Jackson stacked behind Floyd at the line. That's just a handful of the looks that teams can expect to see from the Chargers' two star receivers over the course of a game, and it's extremely difficult to prepare for. The question here: Who does Revis cover? The media seems to think that it'll be strictly Jackson, but I wouldn't count on that. I don't think the Jets will move Revis into the slot and let Gates play on the outside against Dwight Lowery or Kerry Rhodes, either of which would be a terrible mismatch for the Jets. In addition, while Revis has done a lot, he hasn't had to deal with a receiver with Gates' sheer size; not to say that Gates will make it off Revis Island with a big play or two, but he probably has a better chance of picking up consistent yardage across from Revis than Jackson does. Revis is almost certainly preparing to cover both Gates and Jackson, and don't be surprised to see Gates line up as a split end across from Revis or Lito Sheppard more often than people appear to be expecting. Revis can't cover everyone, and while Rhodes has looked great since returning from his mid-season benching, they're going to get mismatches against him, Sheppard, or Lowery on most plays. They want Jackson against a safety one-on-one, or alone on one side of the field against Sheppard. They want Gates to be able to run a quick slant and muscle his way for yards after the catch. They get Floyd open deep when teams forget about him, and when safeties get focused on Jackson and linebackers get caught in slants and crossing patterns, the Chargers have Sproles, a devastating receiver out of the backfield. Although it's been a disappointing season for Sproles as a rusher, he leads all backs in receiving DYAR and is second in receiving DVOA. His versatility came into play in the Chargers' Week 2 loss to the Ravens, who (as we've mentioned more than once) run a very similar defense to that of the Jets. Sproles caught an 81-yard touchdown pass in the first quarter and never got touched. The Chargers started with Jackson split out and then motioned him into the slot, next to Chris Chambers. The Chargers ran a standard "clearout" set of routes, with Chambers and Jackson running slants over the middle of the field and Sproles sprinting out of the backfield on a swing route. The over-aggressive Ravens defense pinched on the quick slant opportunities over the middle, and while Ray Lewis saw what was happening, he got caught up in what amounted to a pick play, and Sproles was sprung. It took an ankle-breaking juke of Ed Reed fifty yards downfield, but Sproles was left wide open for one of the easiest touchdowns of his career. He also had success with several different screen passes against the Ravens, and while Philip Rivers has struggled throughout his career with accuracy on short throws to his halfbacks, the Chargers should be able to exploit the Jets' aggressive defense with their screen work. Their 53 percent success rate on screens is the fifth-highest in the league, and while the Jets have a decent 56 percent success rate against the screens thrown at them (league average on defense: 59 percent), New York allows an average of 12.2 yards per screen pass; the Dolphins are the only other team above ten yards per attempt, at 10.9. The screen is nice, but the Chargers' offense is built around the deep ball. Rivers does not hesitate to throw the ball into coverage, as long as it's a one-on-one matchup with one of his tall receivers against a diminutive cornerback, and Jackson, Gates, and Floyd are extremely capable of beating any corner or safety in the league to a jump ball. The Jets will hope to mitigate the deep passing game with their pass rush, but the Ravens weren't able to do that effectively in Week 2, with Rivers throwing for a career-high 436 yards on 45 attempts. That's not to say Rivers had all day to throw; the Ravens had two sacks and a handful of hurries while forcing Rivers into a handful of ill-advised throws when he was being hit or in flux; two of Rivers' passes under pressure were picked off, including an attempt to throw the ball away that was caught by a diving Dawan Landry. Beyond those questionable decisions, Rivers stood tall in the pocket and made a number of excellent plays with rushers bearing down on him. Of course, the pass rush has to get there in order for Rivers to be troubled, and there's no guarantee that's the case. That Ravens game was with a totally different line; left tackle Marcus McNeill had a hand injury and wasn't 100 percent, center Nick Hardwick was out, right guard Louis Vasquez was injured, and the right tackle was turnstile-like object Jeromey Clary, who is now on IR. Hardwick came back after Christmas (just as backup Scott Mruczkowski went on IR himself with an ankle injury), Vasquez is a regular in the lineup, and versatile rookie Brandan Dombrowski has solidified the right tackle spot after playing both right guard and left tackle at times this year. The Chargers have the fifth-best Adjusted Sack Rate in the league, and in the second half of the season, only the Colts have had a better ASR on offense. On the flip side, though, the Jets have improved their pass rush as well, going from an ASR of 5.9 percent in the first half to 7.8 percent in the second half; that rise took them from 24th to sixth. One way to eliminate the pass rush is max protection schemes, and that could be the Chargers' plan for getting Jackson or Floyd open downfield for a huge play. When the Chargers kept either seven or eight blockers in, they had a success rate of 50 percent, and averaged 10.8 yards per attempt. The rest of the league only had a 41 percent success rate, while averaging only 6.6 yards per attempt. The only problem is that the Jets are great in that situation defensively: They allowed only 4.9 yards per attempt when a team went into max protect, with a measly 31 percent success rate for opposing offenses. The run is also supposed to slow down the pass rush, and while that cliche may or may not be true, the Chargers don't have a running game to test the idea with. Despite likely spending more money on running backs this year than any team in football, the Chargers' rushing DVOA is last in the league, at -11.2%. It's hard to find a nice thing to say about their work on the ground; they're last in the league in power situations, next to last in second-level yards, and last in open field yards. Their game against the Ravens ended on fourth-and-short near the red zone, when Ray Lewis ran a perfectly-timed stunt right through the backside A-gap, going untouched before hitting Sproles in the backfield, who just happened to be the ballcarrier. It was one of the most magnificent individual defensive plays of the season, but that's no excuse: The Chargers need to do better. In all fairness, the rushing attack improved from 31st in DVOA over the first half to 23rd in the second half, but then again, 23rd still isn't very good. If the game comes down to converting in short yardage, the Jets will win. Sproles is fast, which means "great" to the untrained eye, but he's been exactly league-average on kickoff returns this year and slightly below-average on punt returns. Despite Mike Scifres' reputation, the punting unit has been just marginally above-average, and while Nate Kaeding's been an excellent field goal kicker, he gives back most of that value on kickoffs. The Jets allowed Bernard Scott a big game last week, with the Bengals' return man starting off the tilt with a 56-yard return and Rico Murray throwing in a 23-yard punt return. Last week, Jay Feely was forced to serve as the Jets' emergency punter after Steve Weatherford was diagnosed with an irregular heartbeat, but Weatherford should be able to play this week. In the hope of getting some idea of how the Rivers vs. Revis battle will turn on, I plugged the teams' respective pass offense and defense DVOA into my fantasy matchup projection system to see what it spit out. There's only five matchups it sees as comparable: Rivers' two games against the Steelers last year, and three Steve McNair games in 2003, in which he faced the Ravens once and the Patriots the two other times. That tells us very little about what will happen on Sunday afternoon, though. As tantalizing as the battle of the number-ones is, it's what happens on the other side of the ball that will probably decide this game. We mentioned in our preview of Jets-Bengals a week ago that the game would come down to execution by the two quarterbacks; clearly, Mark Sanchez out-performed Carson Palmer. If Sanchez can retain that level of execution and performance in his return to Southern California, the Jets may very well win this game. If the Sanchez from the second half of the season returns, though, the Jets are toast. 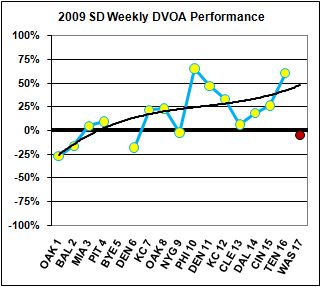 Each team also gets a chart showing their performance this year, game-by-game, according to total DVOA. In addition to a line showing each game, another line shows the team's trend for the season, using a third-power polynomial trendline. That's fancy talk for "the curve shifts direction once or twice." Note that even though the chart appears in the section for when each team has the ball, it represents total performance, not just offense. So . . if the Jets play better, they will win. If the Chargers play better, they will win. Got it. I love those outlooks. Any ESPN watching fool could have told you whoever jumps to a lead in the Ravens game will have an advantage, and whoever plays better in the Chargers game should win... Seriously, WTF? Are the FO scared of making predictions now or something? I'm dissapointed. Nobody expects you to go 4-0 on the games or anything, but I'd at least want to ahhhhhh so you think is going to win with all of your stat powers and all. Nice Job, Bill. Been waiting 17 weeks (or, maybe about 48) for this. First, re: "...Santi caught a quick out at the five-yard line, turned upfield and ran for the endzone…and got waylaid by Reed and then Lewis, fumbling the ball away in the process. Back to the L.E.S for you, young man." I'm dumb. What does L.E.S. stand for? 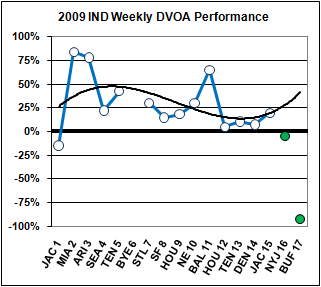 Second, why does the trendline in the Colts DVOA graph go upward at the end? Shouldn't it be flat if those results weren't included? Lumbar Elevation... okay, I give up. That hit on Santi was insane IIRC--Lewis whammed him and spun hm upside down and as he was flipping Reed hammered him. The fact that he still had his pancreas afterwards was promising news, IMO. That was my first guess, but isn't that applying Newton's laws of motion to statistics? I don't think you can do that. Athletes don't improve their performance by not playing. If they did, I would now be able to run a 5K in twelve minutes since I haven't run one in three years. Edit: Now that I think about it, I probably can run a 5K in twelve minutes, provided that I don't actually run a 5K. Running an actual 5K would queer my trendline by adding in more data (such as a 35 minute 5K). As long as I don't run a 5K, my time will continue to improve. This time next year, I should be able to do it in 11:30, provided I don't. Wait long enough and a spot on the US Olympic track team awaits, my friend. In the long run, we are all either quick or dead. That's the short run you're thinking about. Hmm, I'm going to have to pull out my Colts-Ravens week 11 video and see if I can find the exciting moment when Lardarius Webb "lept in the ear". I'm not even sure I can visualize how that works. Also, "Baltimore will spend most of their time against this base defense in a 4-2-5 set" - I think you mean "against this base offense." I assume that the 4-2-5 alignment is sort of a wildcat look--4 OL, 2 QBs and 5 RBs. Very tricky... like the Harlem Globetrotters. I thought they were just going with the HOF formation, 4 QBs 2 WRs 5 RBs. You win the thread, hands down. Not really - there weren't any extended similes about brass water bowls or anything like that. With Wes Welker as Achilles? "Ravens did a good job of taking away Dallas Clark with the same sort of bracket coverage that they placed on Wes Welker in their matchup with the Patriots"
If the Ravens double-covered a guy that didn't even play, how the hell did we get killed so bad? "…that they placed on Wes Welker in their [first] matchup with the Patriots." Presumably he was referring to the Week 4 game against the Patriots. Don't look at it like that. Instead, relish the fact that Welker is SO GOOD that even when he didn't play he had to be double-covered. It would certainly explain all those burly men in black and purple hanging around the hospital room. Bill, that was an excellent piece on the Jets/Chargers (haven't read the other yet). You know all the gritty details of the Chargers O-line and defense changes /struggles this season, and the intricacies of how the team is using its players. I'm so used to being disappointed by lack of knowledge of how a team got to where they are in previews of this nature, but you nailed it. One quick fix to make -- the Colts' 66-yard completion when Ed Reed and Foxworth froze on the pump fake was to Pierre Garcon, not Reggie Wayne. I agree that the Colts had suprising success with the run in the earlier matchup, but a lot of that was because of Trevor Pryce, not in spite of him. Pryce is done. Dwan Edwards is doing very well taking most of his snaps now, with Pryce limited to the role of occasionally playing a rush DL position on passing downs. And Suggs has been mediocre in pass rush this season, but great vs. the run. He missed the first Colts game (as you note). Just like last time, I look for the Ravens to play nickel the entire game, but this time I think they can stop the run. That might be a bad thing, though -- vs. Frank Walker and Company, I feel like the Colts are doing the Ravens a favor every time they run the ball instead of pass it. This is truly excellent reporting. Articles such as this one very much increase my enjoyment and understanding of the games. Many Thanks! Will the switch in venues give the Colts pass rush the extra fractional second to turn some of those Freeney/Mathis hurries into sacks? Well written. Excellent analysis. Great job. I am mystified by the Scifres thing. I see him every week, and it just seems like his punts have excellent hang time and get downed inside the 20 so often. It must just be home-team bias on my part, but damn, when I watch him, I'm in awe. Why is such a big deal that the Ravens had players who weren't 100%, but now are...and the Colts players who were banged up and are now healthy, aren't mentioned? I've never seen a sports media fascination with a team who is 0-7 against another team like I've seen this week with the Ravens. If you knew nothing about football and knew nothing about the 2009 NFL season and only read the various stories about this game over the web and on print, you would never believe that the Colts have beaten this team seven times in a row and that the Ravens limped into the playoffs. This is great stuff. These previews are one of the best features you guys have going here at FO. Whoa, this is like the old days on FO with insightful analysis instead of "here's 250 words of nothing on ESPN insider". Great piece. Please, please, do more of this. The team with the better quarterback play will win. Wow. What dope wrote this article?